Last time we talked about the overall set from the American version and in general I liked it. It was a good simplifying of Notre Dame itself. Click here to read that post. However the problem that arises from fairly stationary main set piece is they way other scene outside of Notre Dame are communicated to the audience and in some case even the faced of Notre Dame itself. 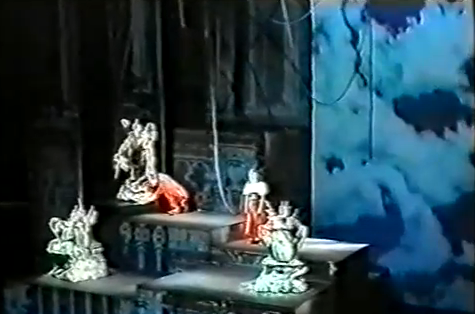 The American version of the Disney musical used moving set pieces as well as lighting. This also the approached that Notre Dame de Paris used and still uses today, albeit they have less set pieces and use more lighting and abstraction. 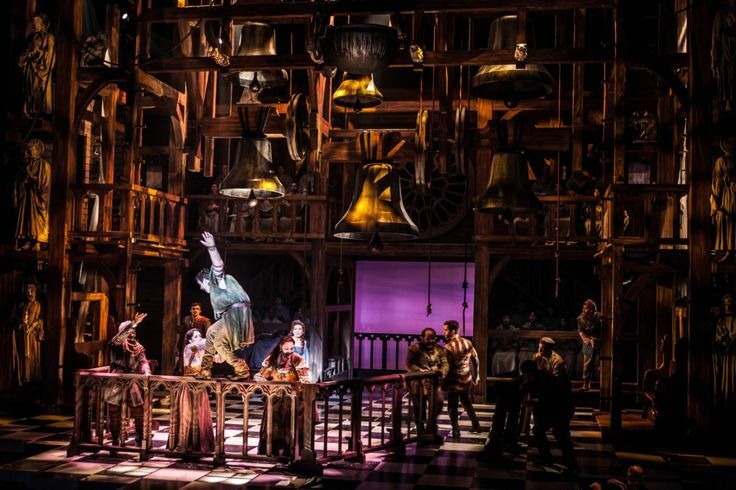 While I do like the primary set, all the other such i.e the set pieces, the extras and the cast does make for a lot of chaos on the stage and makes it at time seem like a cluttered mess. There is just too much and to be fair the differing patterns of the floor with the Rose window of the backdrop doesn’t help. If anything, it like the use of the extras made it lack focus. On Top of the World Der Glockner von Notre Dame. 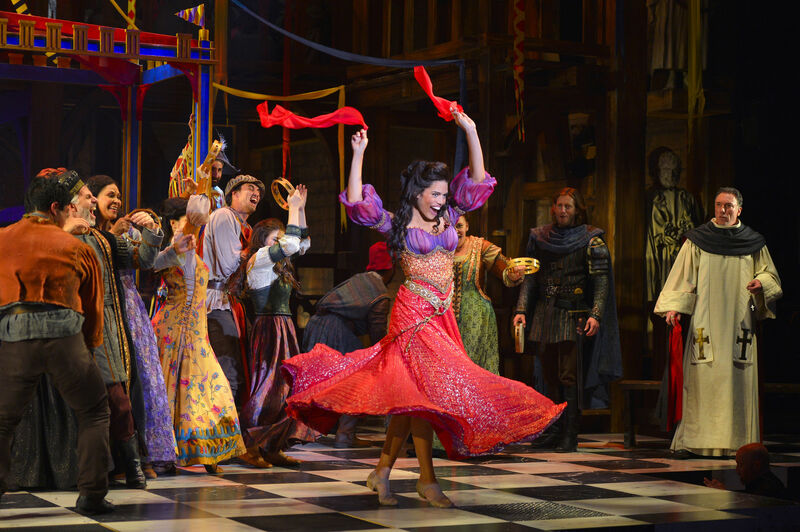 The American Musical version’s closest other version besides the movie, is the 1999 version musical Der Glockner von Notre Dame. Glockner also had a lot of moving parts but in a a very different way. To communicate the height of the Cathedral they used hydraulic lifts with screens and projections. 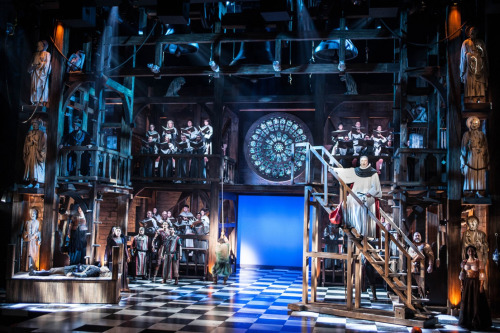 Both approaches is an apple and oranges kind of thing and not every production can have hydraulic lifts, moving set pieces are an easier more flexible approach. By I won’t pretend that I don’t like hydraulic lifts, they are cool to see in action. However there is a price, having your character higher in the high makes them higher from the audiences and it easier to loose that characters connection to the audience. The use of the American Musical moving set pieces isn’t the issue, the issue is how clutter it made things. And when compare to Der Glockner which has it levels and tier that coalesce better and seem more purposeful, it does seem like American version once again could have use some editing. And again if haven’t voted in the poll for the next version you still can. And I still sick so I’m sorry this post is more confused than normal. I think you should do either the second Burbank version, or the Mondo TV version.